So impressive looking! This fig tart is so easy to make though. Whenever I bring it somewhere everyone asks for the recipe. We’ve all had bacon wrapped figs. You know – the ones stuffed with goat cheese. 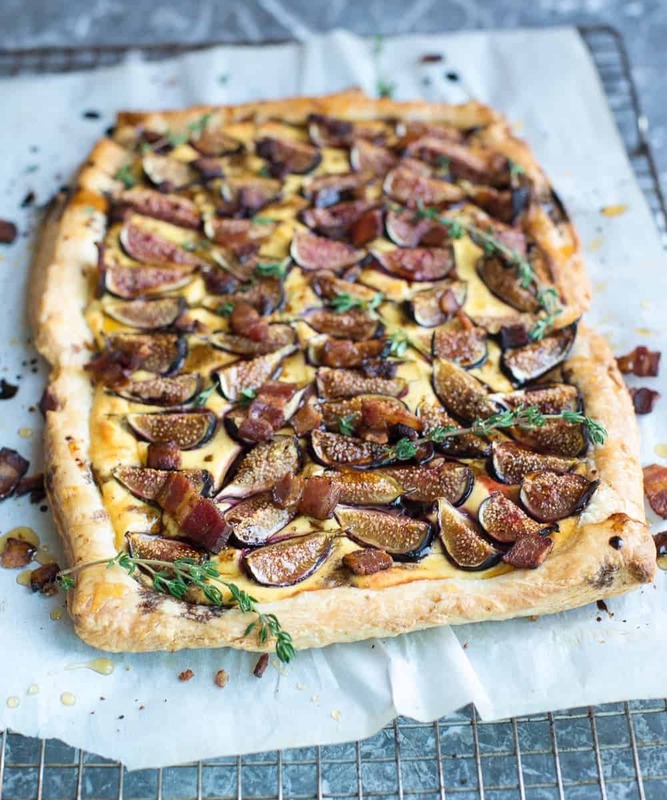 This mind-blowing fig tart brings all of these flavors together in a beautiful and delicious version of this classic appetizer. Never again will you not have the perfect recipe to bring to a party! Whether you’re having your best girlfriends over for wine night or are in need of a recipe because the holidays are right around the corner, this recipe will make sure you’re prepared. This recipe has a ton of fantastic flavor. How can you not fall in love with a light and buttery puff pastry that is filled with goat cheese and then topped with figs, bacon, and honey? Say no more – sign me up! I love recipes like this that are super easy but make you look like a celebrity chef. After the pastry dough thaws the assembly of this dish takes about 5 minutes. It looks rustic and fantastic. The colors and textures are gorgeous. The goat cheese is mixed with a few eggs, some fresh thyme and a little bit of cayenne pepper for a kick. Then the fresh figs are nestled in the cheese, and the whole thing is baked until it is a deep golden brown. When you pull this beautiful fig tart out of the oven, the figs are caramelized, and their fabulous purple juice is spilling out all around them, painting the cheese with magnificent color. Crispy crumbled bacon goes on top and then the whole thing is drizzled with honey and reduced balsamic vinegar. I like to top everything off with more fresh thyme for the sake of color. Using a few whole twigs of thyme give this masterpiece a festive look. If you’re in love with goat cheese, like I am – check out my goat cheese and mushroom bruschetta. All the deliciousness of the classic appetizer (figs stuffed with goat cheese and wrapped in bacon) with even more sophistication. Thaw the pastry dough according to directions. Roll out the thawed dough to an even-ish rectangle on parchment paper. Slide the entire sheet including parchment on a large cookie sheet. Use a fork to pierce the center of the pastry dough. Leave about a ½ inch around the edge un-pierced. Whisk together the goat cheese, eggs, thyme, and cayenne. Spread the filling on top of pastry dough, leaving the edges uncovered. Add the quartered figs, cover as much cheese as possible. Bake for 30-35 minutes, until golden brown. Do not underbake. Add the crumbled bacon and extra fresh thyme. Drizzle the reduced balsamic vinegar and honey on top of the tart. Serve immediately. Thank you so much for featuring our recipe on your post. I loved the whole post!